A course in Claro is created using a selected theme that governs the look and feel of the course and player. This includes the visual design of the navigation bars and buttons, the course page background image, and the position of text and media placeholders in the page layouts and test question layouts. The theme design also contains the Cascading Style Sheet that governs design elements like font styles for headers and body text (including font face, size, and color) as well as shape and chart default colors. Additionally, it may include the design of the endscreens (module endscreen, test endscreen, and course endscreen) and completion certificate. Note: The order and placement of the navigation buttons must stay the same on the navigation bars. This ensures future-proof design (in the event new features/buttons are added). We also do not recommend adding dates (such as copyright) to custom themes. 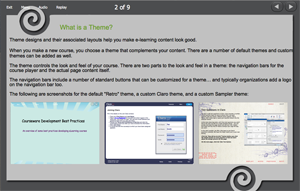 Claro has a set of default themes that can be used for any course. Clients can use the Theme Designer to customize the default Designer theme to match their own branding requirements for color, logo, fonts, etc. Click the link to learn more about Claro's Theme Designer. Clients can request a quote for a fully custom Claro theme. Contact our support team (email support@dominknow.com) for more information.